I've got some sad news. Mark Blackburn, Senior Keeper of the Fitzwilliam Numismatic Collection at Cambridge, died on the first after a long battle with melanoma. 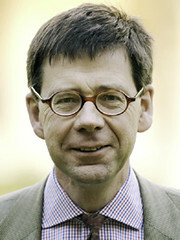 Caius College Cambridge announces with great sadness the death on 1 September of Dr Mark Blackburn, at the age of 58. Dr Blackburn, a Fellow of Caius since 2005, was a hugely distinguished and widely published monetary historian. He was University Reader in Numismatics and Monetary History and Keeper of Coins and Medals at the Fitzwilliam Museum where he transformed his department. He served the College with great commitment as Registrary between 2007 and 2010. The funeral will be on Monday 12 September at St Andrew's Church, Chesterton, at 2.00pm, followed by a private cremation.